Here is a great scholarship opportunity for girls to pursue career in Information Communication Technology(ICT). The PNG government through the NICTA has this scholarship to be offered to girls in 2019. And others recognised by the PNG Office of Higher Education (OHE) or the Education Department which have ICT related study activities. All sections must be completed. Incomplete applications will be disqualified. Please use N/A to indicate unable to answer. Leave no blanks. APPLICATIONS CLOSE: 4pm , 31st January, 2019. 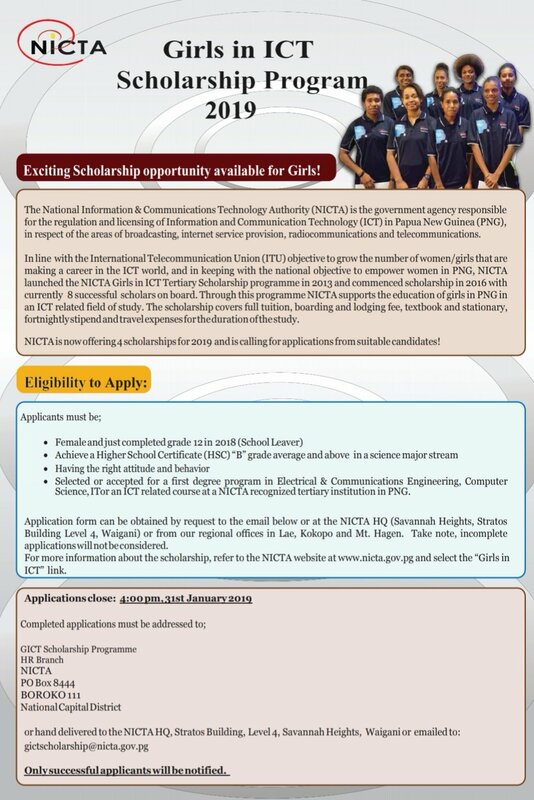 Note : You must have been accepted for a First Degree program in Electrical & Communications Engineering, Computer Science, IT or an ICT related course at a NICTA recognized tertiary institution in Papua New Guinea.